Great are the accomplishments of faith! In the fountain of flame, as in refreshing water, the three holy children rejoiced; and the prophet Daniel was shown to be a shepherd of lions, as of sheep. By their prayers, O Christ God, save Thou our souls! O thrice-blessed ones, who did not honor an image wrought by hands, but were defended by the indescribable Essence, ye were glorified in your ordeal by fire; and standing in the midst of unbearable flame, ye called upon God, saying: Speed Thou and make haste to our aid, O Compassionate One, in that Thou art merciful; for what Thou willest, Thou canst do! ➢ Our Nativity drive for Jackson County Fuel is being concluded. If you still want to donate, please state it clearly on the check or cash envelope! 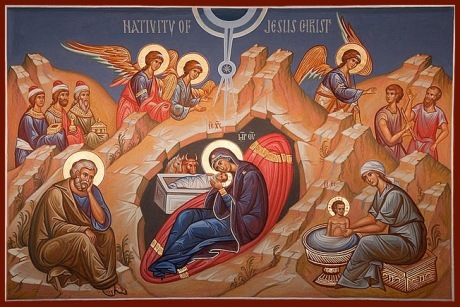 Consult the bulletin insert for the service schedule of Nativity and Theophany services. No Divine Liturgy this Thursday morning! Akathist to the Mother of God at 8.30 next Sunday (Dec 30). Archbishop BENJAMIN is planning to visit us the weekend after Theophany (January 12-13). Choir practice on Saturday, 3.00 pm. “Even if prayer is common for us, it always demands preparation. What is more common for those who can read and write than reading and writing? However, sitting down to read or write, we do not immediately begin, but we calm ourselves before beginning, at least to the point that we can read or write in a peaceful state. Even more so preparation for the work of prayer is necessary before praying, especially when what we have been doing before praying is of a totally different nature from prayer. Thus, going to pray, in the morning or in the evening, stand for a moment, or sit, or walk, and strive in this time to focus your thoughts, casting off from them all earthly activities and objects. Then call to mind the One to Whom you are praying, Who He is and who you are, as you begin this prayerful petition to Him. From this, awaken in your soul the feeling of humility and reverent awe of standing before God in your heart. As you stand piously before God, all of this preparation may seem small and insignificant, but it is not small in meaning. This is the beginning of prayer and a good beginning is half the work. “I suspect that the custom of decorating a tree at Christmas time is not simply a custom which came to us from the West and which we should replace with other more Orthodox customs. To be sure, I have not gone into the history of the Christmas tree and where it originated, but I think that it is connected with the Christmas feast and its true meaning. ‘There shall come forth a Rod from the stem of Jesse, and a Branch shall grow out of his roots’ (Is. 11:1). St. Cosmas the poet had this prophecy in mind when he wrote of Christ as the blossom which rose up out of the Virgin stem from the stump of Jesse. The root is Jesse, David’s father, the rod is King David, the flower which came from the root and the rod is Theotokos. And the fruit which came forth from the flower of the Panagia is Christ. Holy Scripture presents this wonderfully. Thus the Christmas tree can remind us of the genealogical tree of Christ as Man, the love of God, but also the successive purifications of the Forefathers of Christ. At the top is the star which is the God-Man (Theanthropos) Christ. Then, the Christmas tree reminds us of the tree of knowledge as well as the tree of life, but especially the latter. It underlines clearly the truth that Christ is the tree of life and that we cannot live or fulfill the purpose of our existence unless we taste of this tree, ‘the producer of life’. Christmas cannot be conceived without Holy Communion. And of course as for Holy Communion it is not possible to partake of deification in Christ without having conquered the devil when we found ourselves faced with temptation relative to the tree of the knowledge of good and evil, where our freedom is tried. We rejoice and celebrate, because ‘the tree of life blossomed from the Virgin in the cave’. ← Why do we Celebrate Christmas on December 25th?